Back when I made my very first rosary I quickly learned how difficult it is to make your own chain. There is a video tutorial on olrm.org that discusses one method in particular that looks really neat, but I could never quite get the hang of it. This was partly due to the fact that the wire I chose at the time was relatively hard (and I use that term loosly) to work with compared to the soft aluminum that was recommended in the video. So, my first wire choice, the hardest I could find, was 20g anoodized copper. I loved the deep, rich color and was very happy with it’s warm look next to my copper beads. However, after I made a few jump rings and tried to tie the Pater’s into the decades, a small tug easily pulled the peice apart. My rings just were not hard enough to hold up to a good tug (the other problem I ran into was just how easy it was to marr the wire’s coating revealing the brighter color underneath). So, as a compromise, I bought some pre-made chain that was pretty close to the wire but not quite the same. I’m certain that over time, each will discolor / wear out differently. This happens to be one of my other pet peeves many (but not all) rosaries that are made today. Two different kinds of wire was never really asthetically satisfying to me.I know that for some this may seem rediculous, and I can’t really disagree – after all, it is for praying, and at the end of the day God doesn’t care if we are praying on soy-beans and twine or on gold and diamonds. So, just to make it clear, this is a personal preference and is in no way meant to be a slight on those who choose to make their rosaries with pre-made chain. This was my very first rosary using store-bought chain to make link the Pater’s, and I was pretty happy with how it turned out. 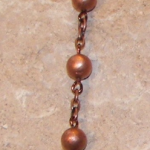 The center of this rosary was a simple hand-made copper ‘triangle’ that I later stamped a cross onto. I’ve since stopped making my own centers and now use Bronze reproduction pieces.But, my personal preference kept nagging me and I knew I wasn’t going to be happy with that construction technique on future pieces. 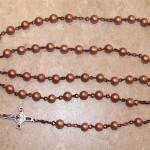 There were several qualities that I decided that I wanted to have in my rosaries. First and foremost was strength. Second was resiliency/stability in the wire’s appearance. Tarnishing, or the wearing off of an anodized layer, is one thing that I’ve put up with over the years. I just accepted it as a fact of life that a silver-colored wire would eventually turn gold (and no, I’m not talking about a miraculous change in wire here – but I actually have witnessed that too. Another story for another day perhaps). The great thing about Stainless Steel, and here I am talking specifically about 316L (304 is good too, as is 308, but 316L is the really good stuff IMO), is that it is easy to heat-treat from a full hard state (which is much harder than what most think of when they use full hard wire – think of hard springs and that’s what you’ll have with full hard 316L) all the way through half-hard down to dead-soft. Also what I love about it is that dead-soft stainless is that it is still hard enough for heavy beads yet soft enough to manage with rosary pliers (although to cut Stainless, you need a hand shear like they sell for memory wire. Do not try to cut stainless with regular wire cutters!). In it’s fully hardened state, one can make jump rings that are incredibly strong. Now, a little metallurgy is in order here. When I talk about strength, I’m not talking about how hard you have to pull on a wire to break it. Aluminum is very soft, but it is also not easy to break. The same can be said for copper, brass, etc.. What I am really referring to is the temper of the wire. We are all familiar with ‘dead soft, half-hard and full-hard’ and know that half-hard aluminum does not equal half-hard <insert other metal here>. What I don’t like about these store bought wires is that I was never able to find the range of tempers that I want in the *same* wire material; and even if it were possible I don’t think that full-hard anything is hard enough for jump rings (at least not hard enough for my liking). 316L was the answer that I was looking for. In it’s full hard state it is much harder than any full-hard wire that I am aware of. The jump rings that I’ve made are very strong and make a very durable chain. With the same wire, a torch and a bit of 220 grit sandpaper, I am able to make it soft enough to form loops with my pliers yet it is still strong enough that it would take a deliberate effort to pull the rosary apart. Wire-wrapped rosaries are still superior in terms of absolute strength, no question about it. You have to break the wire itself to break the rosary, which is very hard to do even with dead-soft aluminum. However, if you’re looking to make a non-wire wrapped rosary and want to have high quality, very strong tarnish resistant wire (316L is surgical grade steel which means that it is designed to handle anything the body can thow at it), and if you want your rosary wire to be uniform, then I highly recommend you give it a try!